USTA Southern produces an annual yearbook, a two-times-a-month email and an eight-page insert into Tennis magazine. The insert goes to all USTA Southern members plus subscribers in our nine states, usually sent in August. The annual 2019 Southern Tennis yearbook contains USTA Southern information, stories and photos covering the news and achievements made in 2018, along with a preview of our direction in 2019. The full 104-page version (seen at right) is available to download. Click here to view the yearbook. This version contatins complete junior and adult rankings, and adult schedules. The complete junior schedule is available at TennisLink.USTA.com. We will still support members who want to receive a condensed, 28-page printed yearbook. Contact our office at 770-368-8200 or by email — and we will mail you a copy. Got an opinion? Click to send feedback to USTA Southern. 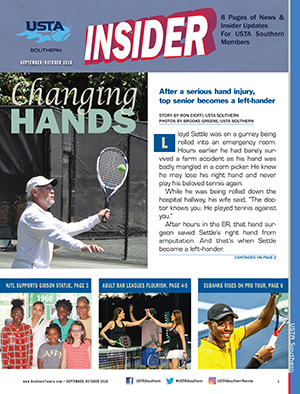 USTA Southern supports its members with an annual insert into Tennis magazine. The eight-page publication focuses on news stories and information aimed at informing members in all nine Southern states. The publicaiton is usually printed in the US Open/September-October edition that hits the streets and mailboxes in mid-August. Click to download the eight-page insert into the September/October issue of Tennis magazine. USTA Southern distributes an email to all members who have email addresses attached to their USTA membership. On or about the 1st and 20th of the month, the email is sent out and contains member benefits, news, announcements and other items of interest to Southern tennis players. In many of our nine states, the USTA state office prepares the email with information for state members on the 10th of the month. Click here to sign up for USTA Southern and other USTA (including the US Open) emails.